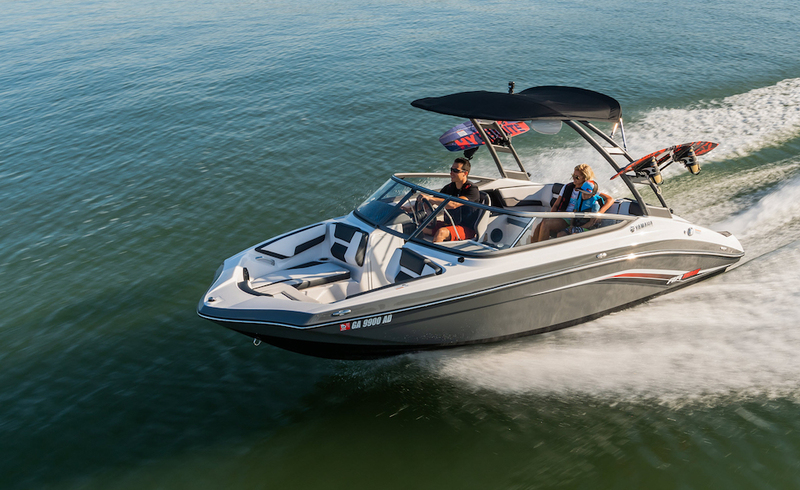 The 2019 Yamaha 275SD sportboats offer dayboat luxury with wide beams that are roomy, powerful and packed with clever innovation. 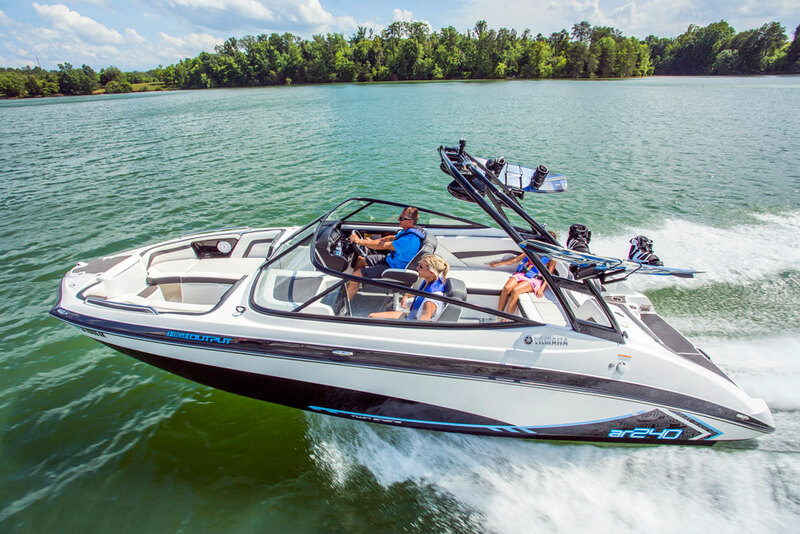 Yamaha’s first foray into the luxury 27-foot runabout category—the 2019 Yamaha 275SD—is powered by twin 250-horsepower supercharged Yamaha marine engines. Available DRiVE technology enhances low-speed maneuverability with paddle controls on the steering wheel, while patent-pending swim-up seating attaches to the stern and sits just below the waterline. 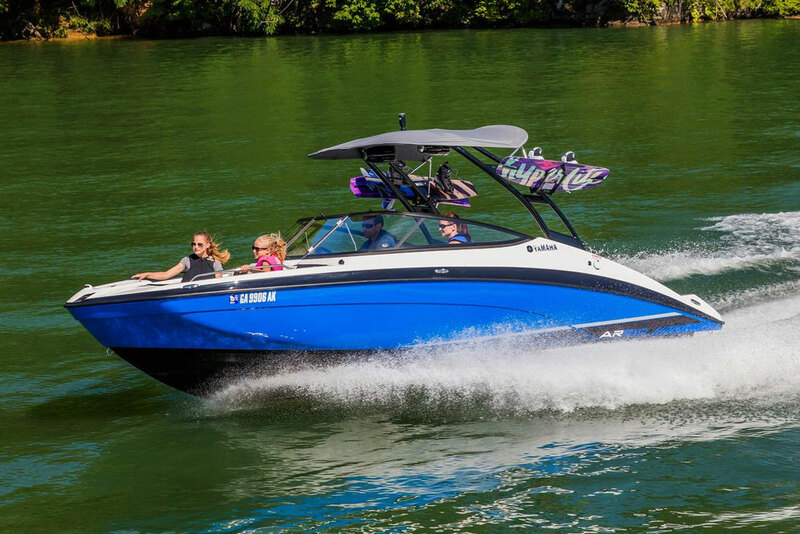 The new Yamaha 275 Series sportboats offer wide-beam space and innovative features that make these boats instant contenders in this larger day-boat category. 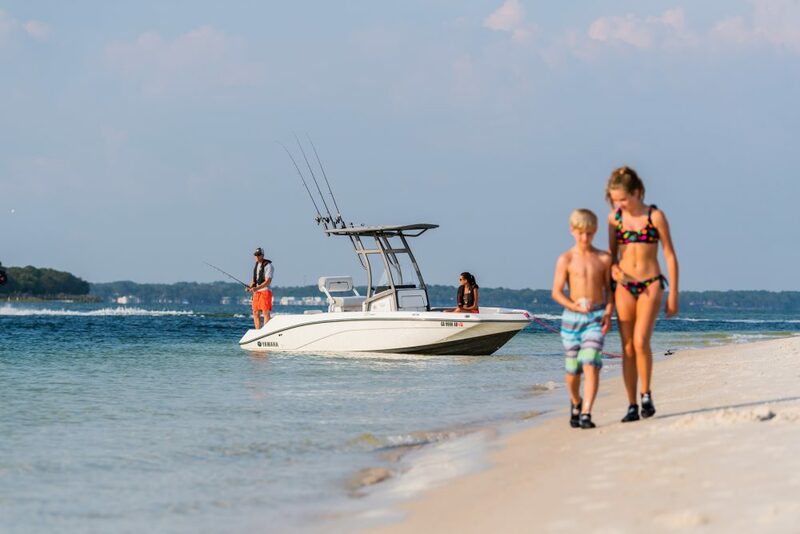 The three models in the 275 Series share a 27-foot length and a 9-foot beam, which means these boats are too wide for every-day trailering, and in fact will not be sold with a trailer. These are boats for families already invested in the waterfront lifestyle. A hardtop with skylight panels is a feature of the Yamaha 275SD. Arching sidewindow frames are an interesting style point. 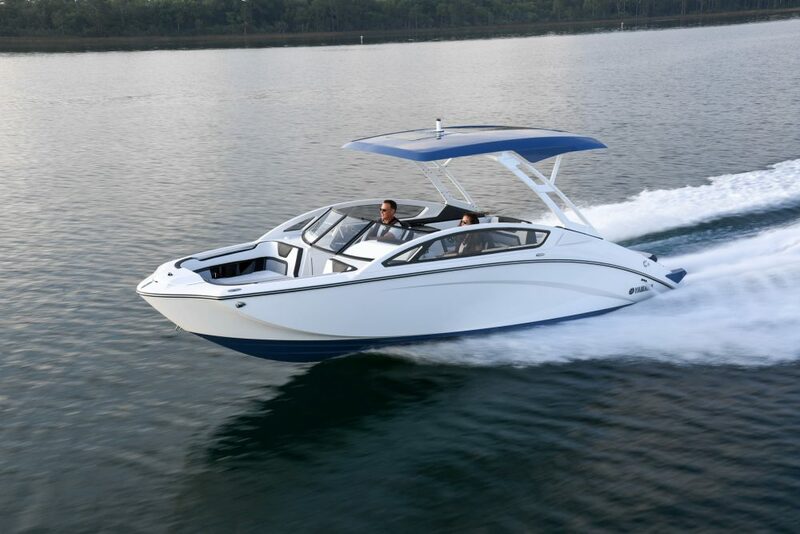 We had our intro to the series aboard the top-of-the-line 275SD ($129,999) which features a tower with hardtop, and expanded galley and Yamaha DRiVE low-speed control system, all exclusive to this model. The 275SE ($114,999) has the same tower but with a canvas top. The base 275E ($99,999) does not have the tower. All models are powered by a pair of 250-horsepower, 1.8-liter Yamaha SVHO supercharged engines driving Yamaha jet drives. A design goal of these boats was to have a flat sole from the swim platform forward, with no step-over to move aft from the cockpit, and the wide beam makes that possible because the low-profile engines can be located far enough outboard for there to be a walkway between them, with a separate hatch for each engine. The result is a boat that’s a great social space. 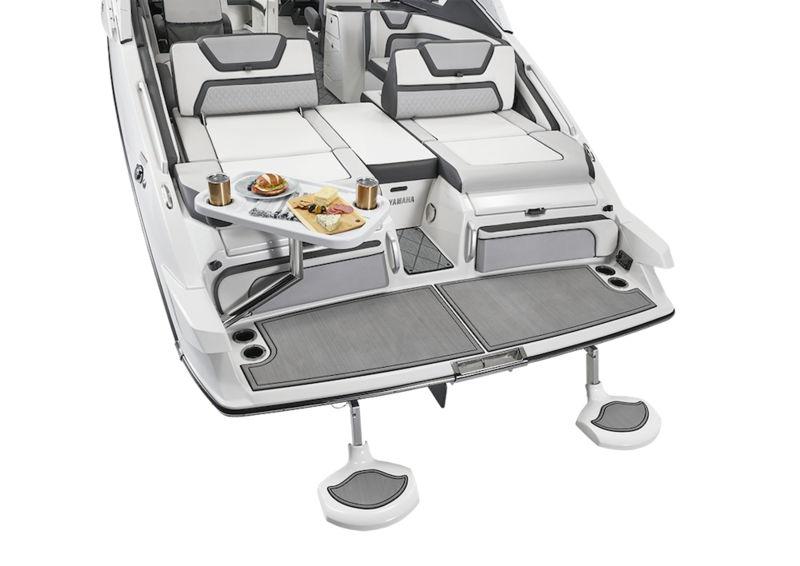 Motor to the cove or the beach and deploy the below-water swim-up seats to turn the Yamaha 275 transom into a lounge. The Yamaha DRiVE system is an innovation made possible by the jet-drive system—reminder that DRiVE is only available on the 275SD model—and is an adaptation of the RiDE control Yamaha introduced for its WaveRunner personal watercraft several years ago. DRiVE is activated by a button on the 12.3-inch Connext touchscreen display and controlled by a pair of paddles located behind the steering wheel grip, similar to the paddle shifters seen on some automobiles. In DRiVE mode, the left paddle throttles the engines in reverse and the right paddle throttles the engines in forward. When both are released thrust reverts to neutral. The system is intended primarily for docking, as there’s enough thrust to control the boat but only to reach no-wake speeds when underway. The idea is that the skipper can shift instantly from forward to reverse thrust without reaching for a control lever. DRiVE is instantly intuitive to use, and it took me just a few minutes and a couple of docking attempts to figure out that if I tilted the wheel all the way up I could stand facing aft between the consoles and steer and control thrust with my left hand while enjoying a better view of the dock I was aiming at, without having to crane my neck or twist around the seat. Paddle shifters behind the steering wheel rim offer fingertip control of forward and reverse thrust at low speeds. The Connext touchscreen appears to float above the dash. Note blue accent lighting on trim and drink holders. It’s also on the speaker grilles. The Connext screen displays all instrumentation plus a boat-load of data, a mapping function, and controls for the standard six-speaker-plus-subwoofer Wet Sounds audio system. The screen appears to “float” above the dash. The display is very bright and easy to see in brilliant daylight and seems easy enough to use. Yamaha has wisely patented another clever idea in its “swim-up” seating feature for all 275 Series models. Each round seat, about the size of a bar stool top, is mounted to an aluminum arms that slips into a receiver located below the swim platform and positions the seat a few inches below the water level. You can face aft and lean back against the platform or face forward and the platform becomes a table. Or a bar. If the seats are installed “upside-down” they are above the water and can function as small tables. In either case the seats need to be removed before getting underway. A view of the stern area with cocktail table, swim-up seats, and filler cushion in place. A remote audio control is located to starboard. The platform surface is padded and has backrests, and the top of each motorbox is padded and fitted with a pivoting backrest that can be positioned to face aft or to be the backrest for a seat facing the cockpit. The aft sections of the cushions lift up to reach wet storage, ideal for small fenders and lines, and access to the jet-pump clean-out ports. In the cockpit there’s bench seating port and starboard, with a pair of captain’s chairs at the consoles. There’s a galley console behind the helm seat with a sink, a deep counter top, a drawer and a space below for a cooler. The port console opens to reveal a very roomy compartment that can be used as a head or for stowage. The bow area can probably seat four adults, and there are fold-down armrests for two lounging passengers facing forward. All 275 models come with bow filler cushions and a dinette table that can be set up in the bow or the stern. There’s an anchor locker in the bow but no provision for a bow boarding ladder. 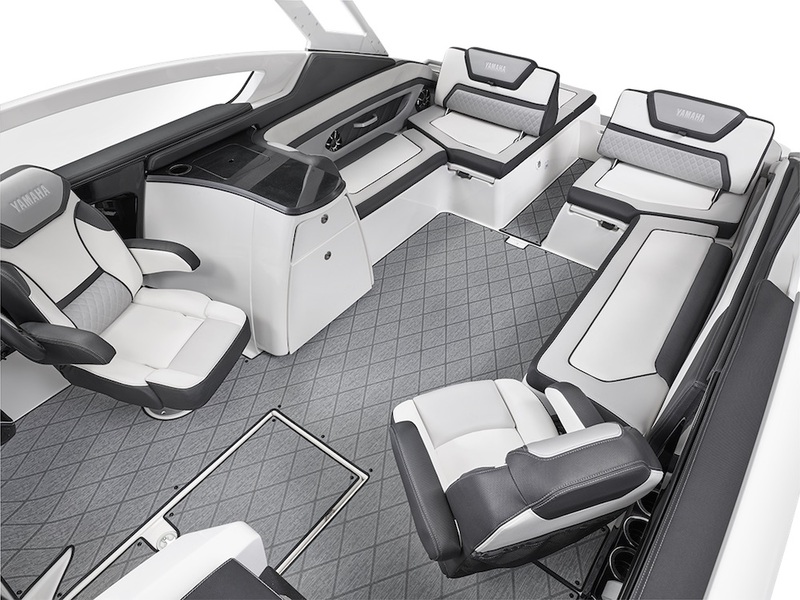 Throughout the boat Yamaha has used luscious vinyl, stainless steel and billet aluminum, soft floor covering and careful detailing to give these 275 models the tone of real luxury. The hardtop with skylight panels is a feature we’d expect to see on high-end center console models. Aboard the 275SD I had a chance to take a short demo ride on the very choppy surface of Biscayne Bay, probably rougher conditions than a family might tolerate for lake boating but a good test for this new hull and its 20 degree deadrise running surface. At moderate speeds the ride was good and I stayed dry. It was too rough to approach top speed or measure it accurately, but Yamaha says the boat is good for 53 mph. When it came time to make a 180-degree turn and head back to the dock, I was surprised at how wide the turning radius felt, especially since quick turns have always been a hallmark of jet-powered boats. The trick to tighten the turn, it seems, it to apply more power. This boat, more than smaller jet-powered runabouts, relies on thrust to get the hull to take a set and make a harder, tighter turn. Because of the rough water I was making that turn at a pretty slow speed. The spread of the engines and thus their jet nozzles may also influence this boat’s handling. It is equipped with the same rudder-like articulated keel device found on other Yamaha boats, but that feature seems to be more effective at off-plane speeds. I’d like to see how the 275 handles on smoother water. There is also the matter of the arching sideglass frame, a stylistic embellishment that carries the aft gunwale line gracefully forward, but which also blocked my view forward to port when I was seated at the helm—it curves downward forward of the windshield. Others who drove the boat after me said the frame did not impede their view much, so I think stature and eye level matter in this regard. I’m just over 6 feet tall. A helm seat adjustable for height might be an easy solution. 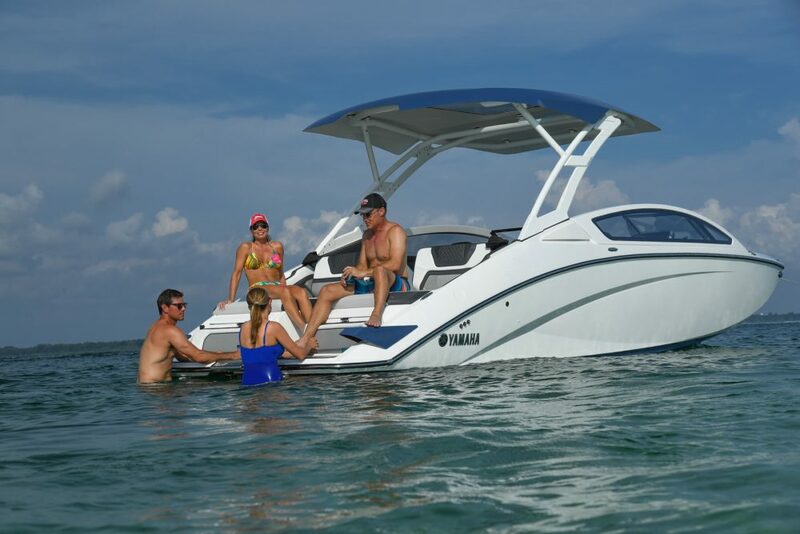 The Yamaha 275 Series takes the advantages of jet propulsion—minimal draft, no propeller, easy of maintenance—to a new market segment, and a new price level. 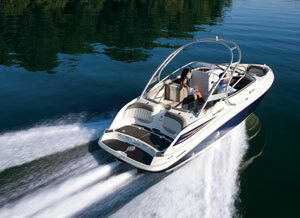 The boat’s lux tone and quality, its clever features and the interesting styling justify the price point. 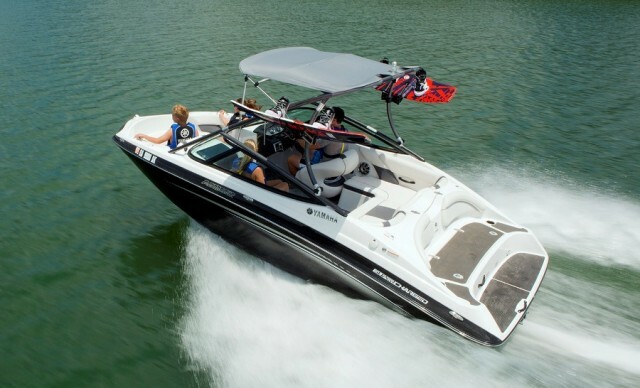 See Yamaha 275SD listings, and be sure to read more about this jet boat category.